The Mister Big behind the scandal of George Bush’s firing of US Attorneys is not a ‘mister’ at all. The House Judiciary Committee has released White House emails indicating that the political operative who ordered the hit on prosecutors too honest for their own good was Harriet Miers, one-time legal counsel to the President. But this is not the first time that Miers has fired investigators to protect Mr. Bush. In 1999, while investigating Governor George Bush of Texas for the Guardian papers of Britain, I obtained an extraordinary, and extraordinarily confidential, memo to the US Attorney’s office in Austin. It disclosed that, in 1997, Governor Bush secretly suggested to the chairwoman of the Texas Lottery Commission that she grant a contract to the client of a Bush ally. The Governor’s back-door demand to the Lottery chairwoman was not so easy. Bush wanted the Lottery to grant a multi-billion dollar contract to GTech Corporation. But GTech hadn’t even bid on the contract – and a winner was already announced. There was only way for the Chairwoman to carry out the fix: fire the director of the Lottery who had discouraged GTech from bidding because of its history of corruption. The Chairwoman, Harriet Miers, did the deed: fired the Lottery director; Miers then ignored the winning bid — and gave Bush’s favored company the contract, no bidding, in perpetuity. Neither Miers nor President Bush have ever denied the contents of the memo [I’ve posted it here] despite repeated requests from the Guardian and BBC Television. Bush’s attempt to appoint Hit-woman Harriet to the US Supreme Court in 2005 surprised many. Not me. Miers, personal and governmental lawyer for George Bush, had quite a file on her boss, and he must have been grateful for her discretion. Most crucially, she knew why Bush so desperately needed to give GTech the lottery contract. The heart of the matter was the then-successful cover-up of the Bush family’s using its influence to get young George Bush into the Texas Air National Guard and out of the Vietnam war draft. Lt. 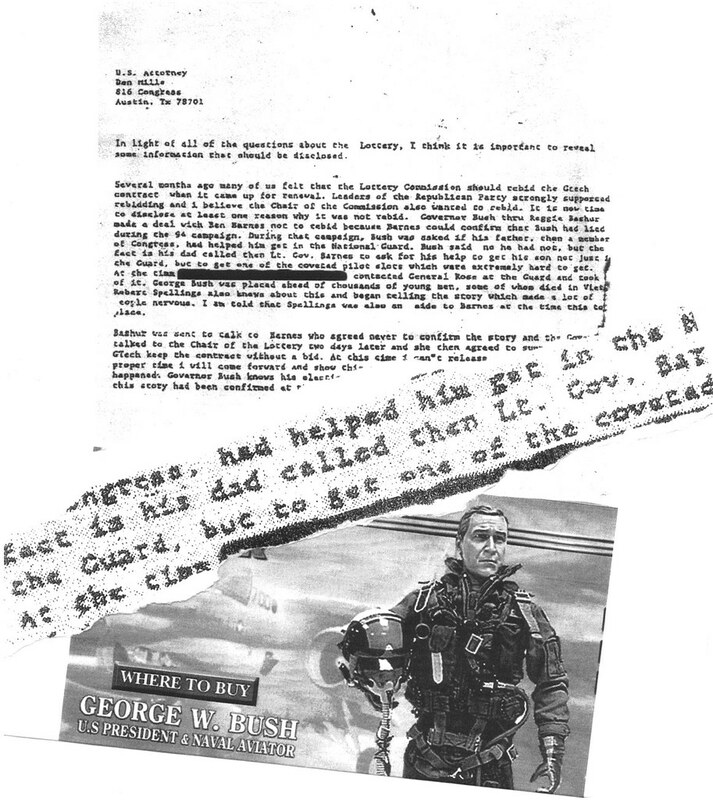 Governor Barnes, through a cut-out, called the Texas Air Guard commander and got Bush into the ‘top gun’ seat and out of the war. What 60 Minutes missed is the creepy Miers involvement. Barnes, after he left the post of Lt. Governor, became a lobbyist — for GTech, the lottery company. By using his influence to get and keep the lottery contract for GTech, Barnes picked up quite a nice fee: over $23 million. With those millions in his pocket, Barnes kept a happy and lucrative silence about his saving little George Bush from the draft. Note something else here: this information was sitting in the hands of the US Attorney. Yet, no action was taken in 1997 though we now know that, from Barnes’ confession in 2004, the accusation about his putting in the fix for young George Bush is true. An insider told BBC TV that the US Attorney’s office and Justice Department, though under Democratic control, never acted because they discovered that Barnes, a Democrat, had not only manipulated the system to get George Bush into the Texas Air Guard, Barnes did the same for the sons of Democratic big wigs including Congressman (later Senator) Lloyd Bentsen and Governor John Connolly. In other words, control over a US Attorney and what is called their “prosecutorial discretion” is worth its weight in gold to politicians. They can provide protection for cronies and exact punishment on enemies. And no one knows that better than “Justice” Harriet Miers and her boss, fighter pilot George W. Bush. This report is adapted from Greg Palast’s New York Times bestselling book, ARMED MADHOUSE: From Baghdad to New Orleans — Sordid Secrets and Strange Tales of a White House Gone Wild. New edition to be released April 24.